Announcement We make handmade vegan cold process soaps. We also make an entire line of vegan and gluten free bath and body products. We make all of our products fresh, from scratch, with no bases, only the finest quality oils, and other natural ingredients. Premium quality is our number one priority. We believe our products are a true indulgence you deserve and your skin needs. We all need to remember to take the time to pamper ourselves a little, without guilt. We make handmade vegan cold process soaps. We also make an entire line of vegan and gluten free bath and body products. Homemade Soap Gift Set 6 Gothic Soaps in Exotic Scents- Vegan Soap Sampler! This was a very slow transaction from the purchase to receipt of my soap. Purchased on March 3rd, marked "shipped" on March 9th but no tracking number was provided. I contacted the seller on the 15th as I didn't receive my order. (we live in the same city so should have been quick) Seller wrote back the same day and promised to look into it. It was marked "shipped" again but this time there was a tracking number. Received my order on March 19th. The soaps are lovely and nicely packaged if you wanted to give them as a gift..... Luckily I was not in a hurry as these were for me. Soap is ok, but scents are very flowery! Disappointed wanted fruity scents and earthy scents and all I smell is flowers. According to the description there should be lots of fruity smells peach, lemon, cherry, raspberry. Earthy smells like sandalwood, currant, patchouli, cedar, musk. Nope very flowery. We are sorry you were not happy with the scents. We use all Victoria's Secret duplications in this set, we just change the names. The description is what the fragrance company uses, we don't make our own fragrance blends. We don't offer one called Earthy, but Wild Thing is a duplication of Angel perfume, which has patchouli in it and can be considered earthy scented. A passion for top quality soaps and body products grew into something I'm proud of. I believe I was born with soap running through my veins, or at the very least, passion running through them for what I do. I have always LOVED soap and luxury lotions and such, ordering them from all over the world. About 10 years ago I decided to make some lifestyle changes, and live more simply. Cutting back on my expensive soap habit was one, so I started researching how to make it. I was amazed to find out that what I was buying wasn't top quality at all, some were even bad for your skin! Once I made my first batch, that was it, I was hooked. I have tried and tweaked every recipe imaginable to come up with one that I believe is the best. Our soaps have a rich, creamy lather, which is moisturizing but leaves you feeling clean, without stripping your skin of precious oils. We love to evolve and try new things, always wanting to offer new and exciting products for our customers. We sell at farmers markets and local events, and love being part of our community. We also have our other business on Etsy, Itty Bitty Soap Committee, which is soap favors for every occasion. is to help others be made aware of what they are putting on their skin, especially since your body absorbs up to 60% of what you put on it. 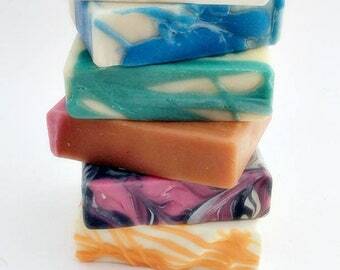 Commercial soaps are made up of harsh chemicals and over time can cause allergies and skin conditions. Read Labels! are made the cold process method, from scratch, which is a long process, taking 4 weeks total. We are a Vegan and Gluten Free company, using coconut milk in every batch. To read more about that process go to our shop policies page. We do offer some products at wholesale, for a minimum order, and to licensed businesses only. 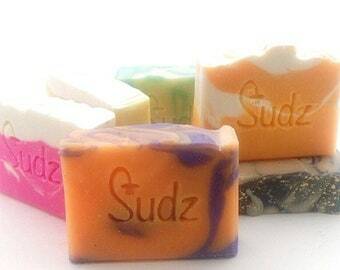 Our soaps are sold in small stores and boutiques around the country and overseas. We love our customers and are so very thankful for each and every one of them. My name is Kimberly and I live in beautiful Oregon, where I love to spend time with my friends, family and animals, enjoying the outdoors, hiking, camping and whitewater rafting. More than anything though, I LOVE to make soap every chance I have. Tami helps me with everything besides the actual soapmaking. She is my support and my friend, she never lets me down. Are orders guaranteed to be on time for the Holidays? Over the holiday season we hire extra helpers for packing and shipping. We get almost all orders out next day and send everything priority mail by USPS. The only time we send First Class mail is if it’s an order for less than $15.00, and it’s so we can keep shipping low cost on small orders. Our shipping is below cost for you this season at only $5.00 on all orders above $25.00. If you get charged more just send me a message and we’ll credit you. We will be shipping in time for Christmas arrival up until Wednesday December 19th. Of course the Postal Service can’t guarantee this but they are amazing and have never let me down.